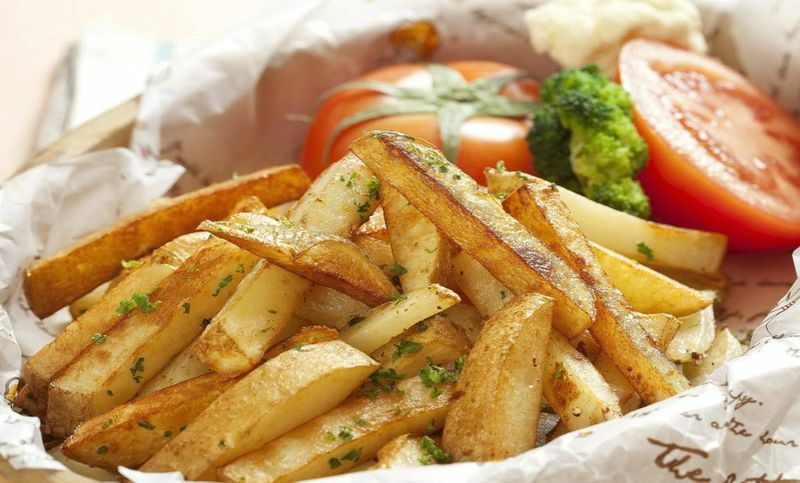 Begin by cutting floury potatoes into chips that are about 1cm thick. Then soak them in a bowl of cold water. This prevents them from going brown and rinses off excess starch that could cause the chips to stick together. Drain the chips and pat them dry with a tea towel. Fill a deep, heavy-based saucepan no more than half full with vegetable oil. Heat the oil until a bread cube dropped into it sizzles gently. Hot oil is very dangerous, so do not leave it unattended. Using a slotted spoon, lower a few chips at a time into the hot oil. Fry for about eight minutes until the chips are tender, but not browned. Remove from the oil with a slotted spoon and set aside to drain on kitchen paper. You need to fry the chips twice, once to part cook them and a second time in hotter oil to give them crispiness and color. Increase the oil temperature until a bread cube dropped into the oil sizzles and browns in 20 seconds. Lower the part-cooked chips back into the oil, working in batches if necessary. Too many chips added to the pan will reduce the oil temperature and stop them from crisping. Fry them until they are crisp and golden-brown. Remove the chips with a slotted spoon and set aside to drain on kitchen paper. If you need to, chips can be kept warm in the oven, spread out on a tray in a single layer. The oil can be left in the pan to cool completely. It may be used for frying 3-4 times more.